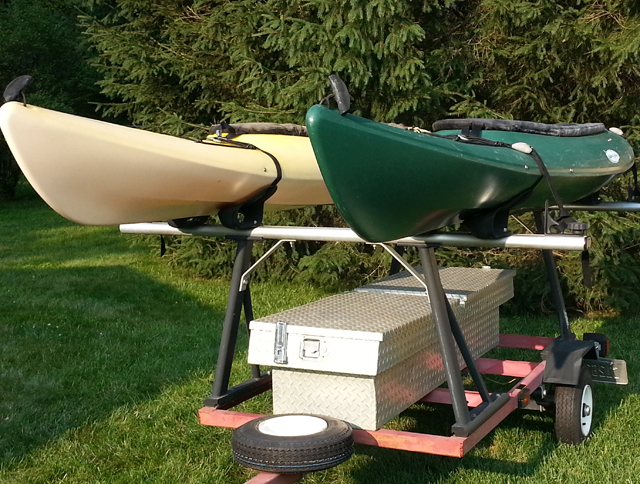 It had been nearly two years since we’ve had the kayaks off the custom-made trailer and in the water. Some summers it seemed life just got in the way of a float. But not this summer! We cleaned and loaded those babies, packed a nice lunch and hit the chain of lakes over in Pinckney. We’ve always put in on Hyland Lake where’s there a nice little boat access. For a quick trip we’ve spent a couple of hours just floating around the lake’s shoreline. Hyland Lake also connects to another small lake so it’s a nice way to spend a few hours. But on Monday we decided to make a day of it and float down the chain and enjoy time in the outdoors. So we donned our swimsuits, slathered on the sunscreen, put hats our heads and hit the water! I love floating through the little canals and rivers that connect all the lakes on this chain. 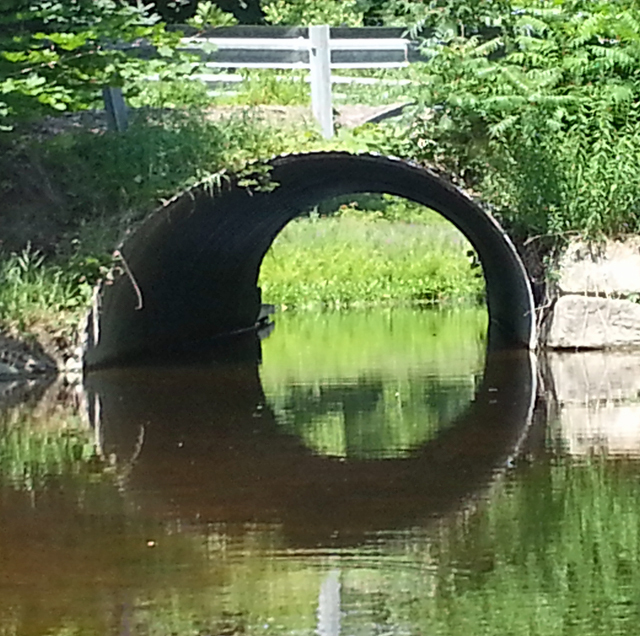 The first little stream travels past a few houses that line the water’s edge and there are a couple little tunnels that are fun to go through. When I was a kid we would whoop and holler and listen to the echos. On this day I just enjoyed the quiet. 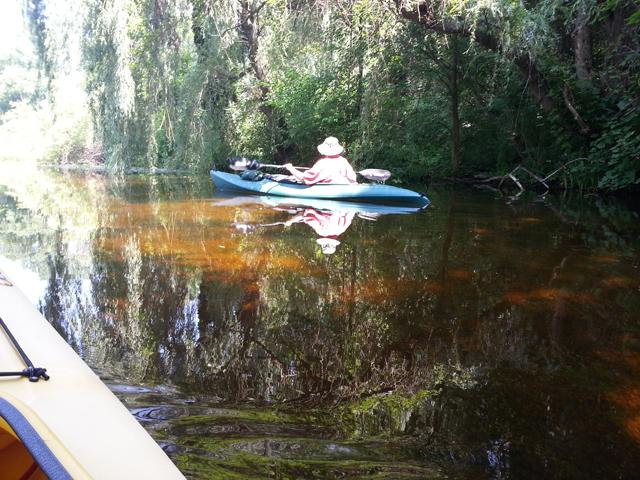 The weather was just perfect for being on the water – high 70’s to low 80’s and sunny. Just a slight breeze so we never really had to work hard to paddle across any of the lakes. 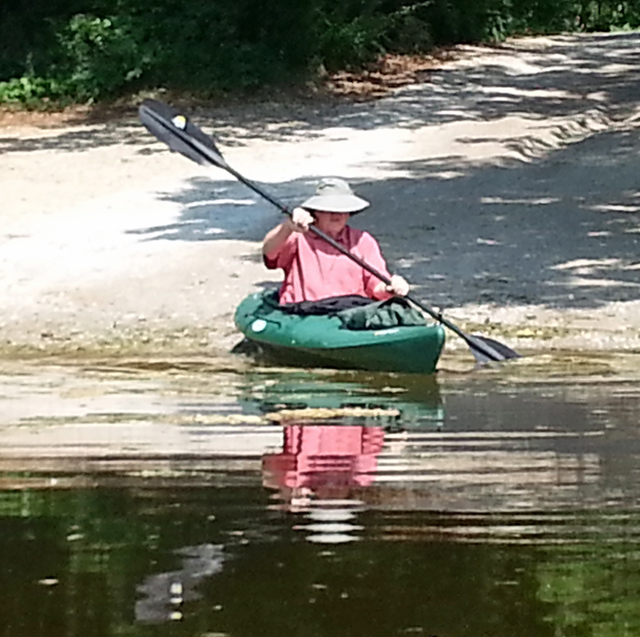 And, we paddled through many! We also got a glimpse of the new Yert on the river entering Bruin Lake. The Yert sits close to the river’s edge and would be a lovely place to spend a night or two. There was a family staying there or we would have pulled in to investigate more. Floating along the water’s edge we seen heron fishing for their next meal, lots of fish, a few turtles and lots of singing birds. After paddling through six lakes we worked up an appetite. We had a hard time finding a nice place to pull in for lunch. Seems there are lots of marshy edges along all the lakes and streams so we finally gave up and pulled over near one of bridges that cross the river for the Potawatomi Trail. 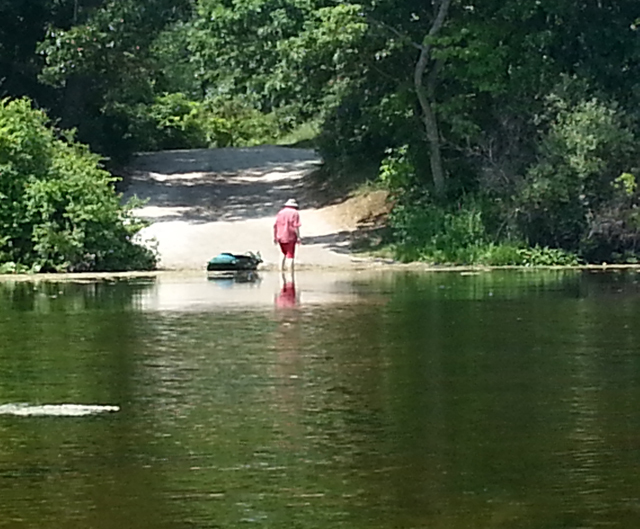 We spread lunch across the backs of the kayaks and ate while wading in the water. We waved to a couple of bikers on the trail as they crossed over the bridge (too hot for me to be biking out there) and chatted briefly with other boaters cruising the river. Lunch consisted of Dennis’ chicken/cranberry salad in pita pockets and some of my potato salad; it all packed up nice and was easy to serve. 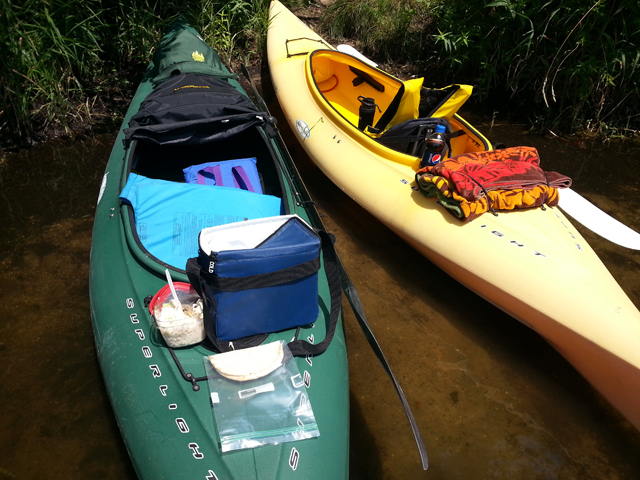 We each can carry a small cooler in the kayaks so we put food in one and water and soda in the other. We use regular dishes so everything goes home with us for washing and/or recycling. After lunch we began our journey back to the boat launch, but we were in no hurry – besides, it’s hard to hurry in kayaks! We left the house around 10:30 a.m. and got off the water around 3 p.m. and headed over to check out the beach at Bruin Lake where there is also a boat launch. We were hoping to find a beach and picnic area we could us while traversing the waters for next time but were told the beach is for camping guests only. We did discover that Half Moon Lake also has a beach and boat launch and that is open to anyone so maybe we’ll try that one next time. Before loading we took our first selfie! Not a very good one but we got it! 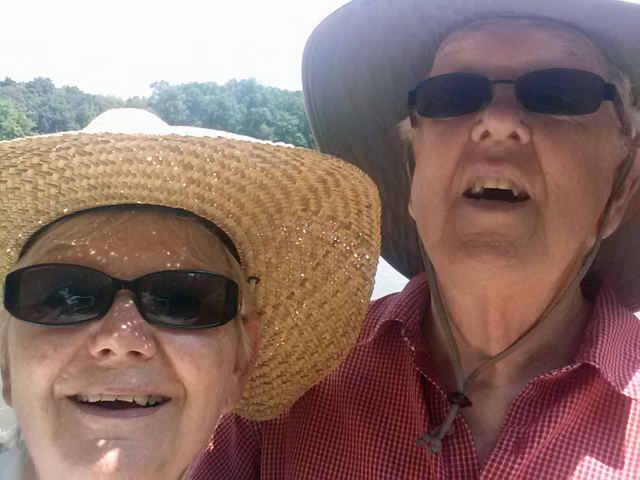 It was a lovely day on the water and we finished it with an ice cream cone – dipped in chocolate and nuts – from Captain Frosty in Pinckney – YUM! * I’ve recently decided to change my blog up a bit and my new tag line is “the scraps of life.” Rachel came up with that one for me – “The Facts of Life” was one of her favorite TV shows in her younger days. On my blog I want to include more of my everyday life as well as my scrappy projects. 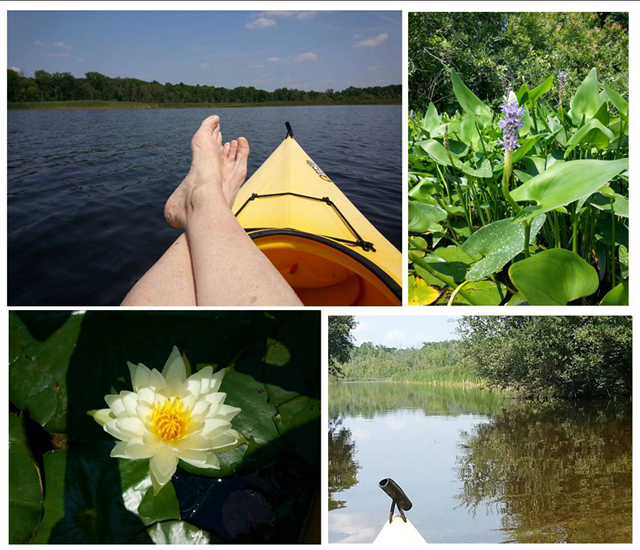 There are just so many things that fill my days and I want to share posts about scrapbooking, gardening, cooking and more – it’s what makes me a whole person. Great post! I love that you’re expanding your blog. It is what you wanted in the first place. Sounds like a wonderful adventure. Glad you had such a wonderful day enjoying natue. We did enjoy ourselves, Sandy. Thanks! What a great day you had, I enjoyed reading all about it! So glad we have these lakes and rivers to enjoy. Hey, Kay! Long time no see. Hope all is well with you. Glad you enjoyed the post. Watch for my schedule in Saginaw. Sounds like you had a very nice relaxing eventful day. We did, Janet. It was a very nice day out!